"It never fails. The world could be ending tonight, and we'd still have a full house. Hm -- What's that noise from Belushi's dressing room?" 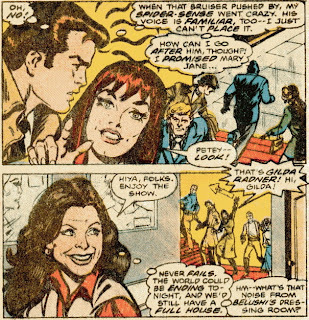 - Gilda Radner, commenting to herself prior to performing in a 1978 episode of "Saturday Night Live," which is soon to be disrupted by the Silver Samurai and his goons, in Marvel Team-Up #74 (Marvel Comics, Issue Date: October 1978). What is bizarre about the fact that Lee is the SNL guest host is that his presence establishes that Marvel Comics, the corporate enterprise, exists as a company within the Marvel Universe. Put another way, in a world where superheros exist, fight, and frolic, consumers still, apparently, buy comics about superheros - and not fictitious ones, either. (In Alan Moore's Watchmen, comic book readers follow the exploits of pirates instead of costumed superheros, about whom they can read in the newspaper.). Not only do customers purchase comics, but apparently, they do so in such numbers to make Marvel a successful enough company that Lee is invited to appear on a nationally televised sketch comedy show. Pre-meta meta, anyone? And was such a tragic accident truly as unforeseeable as Johnny Storm's grief suggests? Certainly, if the Marvel Universe is anything like our own, then children injure themselves using certain products in an attempt to emulate television and cinema. 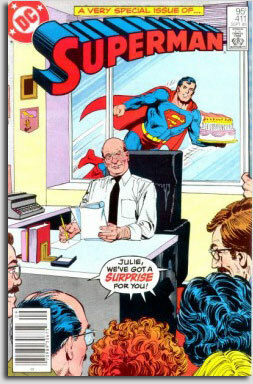 This should not be a surprise to a hero who regularly visits outer space, fights aliens and monsters, and generally sees death and destruction on a rather frequent basis. After all, was it not eight years before this issue appeared that Saturday Night Live parodied cheap Halloween costumes and "a bag of oily rags and a lighter" sold as a "Johnny Human Torch" costume? Thus, Marvel Team-Up #74 confirms that SNL and the Fantastic Four exist in the same universe, which means that Storm would have been aware of Aykroyd's gag (which went unreferenced in FF #285, despite Storm's acting as if the accident was unforeseeable). Really, Marvel Team-Up #74 is less interesting as a narrative than as a relic and a bizarre cross-promotional item. One wonders how the cast reacted when the issue was inevitably delivered to 30 Rockefeller Plaza following its initial publication. Did they enjoy it? Were they awed by being in an actual comic book? Or did they pay it any mind at all? I found no reference to it in James A Miller and Tom Shales' Live From New York: An Uncensored History of Saturday Night Live, as Told By Its Stars, Writers and Guests (not that the issue would be among the first memories to be recounted by anyone affiliated with the program). 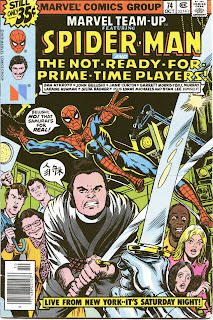 The issue would be less interesting, perhaps, if the 1970s era SNL were not still so much in the public memory and consciousness, so I suppose Marvel's marketing department made a good decision in making the cross promotional. It could have been much, much worse. I have no idea how it started, maybe with Shooter, but it was probably Claremont's idea -- he was always full of ideas and had not yet found his niche as the richest writer at Marvel because of the X-Men . I was an editor and assigned myself to draw, figuring it would be fun and that I might get to interact with the celebs. We did get to go to 30 Rock and watch rehearsals but clearly none of them had time to schmooze with lowly comic book types. We all shook hands with Lorne Michaels and I got to sketch the studio. Mainly, though, we talked with NBC lawyers. We were going to use the NBC symbol along with the usual Spider-Man logo in the upper left of the cover since we wanted to avoid featuring one Saturday Night player to the exclusion of the others. The lawyer went on and on about proper use of the logo and we (Claremont and Shooter if I remember right) couldn't figure out why. Then it hit me and I said, "I understand; I'm from Nebraska." The lawyer turned green -- literally -- but said, "Then you know what I'm talking about." As I explained to Shooter later, a staff artist named Jim Brown, who worked for public TV in my home town, Lincoln, Nebraska, had come up with exactly the same logo for the Nebraska ETV station at least a year before NBC (after most likely paying some agency a 100,000 to create the thing) started using the image. Shortly before we did the comic, Nebraska sued and NBC settled for something like a million bucks. Hence the paranoia. I was not the best choice to draw the comic. Claremont was a TV fan and while I watched Saturday Night Live, that was about all. 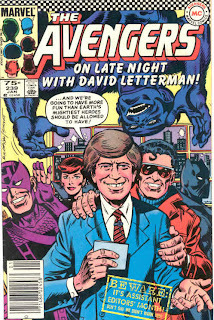 Claremont wrote something like "The Muppet Show meets Saturday Night, meets The Avengers." I was OK with the Avengers but the Muppet references were lost on me. Whats more, it was the 70s well before VCRs let alone the Internet. Getting useful reference was difficult to impossible, even for the Muppets. For instance, Chris wanted me to draw the two old guy puppets who sat in the balcony were critics of the show. I just couldn't find pictures of them and ended up, I think, drawing them from behind from verbal descriptions. I would have watched the show, but I had a play running off Broadway and I was there every night. The Network could not be bothered to send us more than a few old head shots of the Saturday Night cast. As an editor, I should have fired me and hired someone who understood Chris's story adaptation and could draw at least some of it from memory. Marie Severin inked the thing and knew some of the references so that helped -- although we had very different styles. Actually, that was so early in my career, I don't think you could say I had a style at all, really. The best part of the project was that someone engineered me and Shooter and some of the bullpen going to the premiere party for Animal House; I can't say if Chris was there. It was at one of the famous clubs but I don't remember which one. We went out in the alley with Belushi and presented him with the cover. Belushi passed a joint around -- so I can say I smoked dope with John Belushi. I did inhale, this was after all the 70's. The two Muppet characters Smith references are Statler and Waldorf, who sit several rows behind Parker and Watson in the balcony of the SNL studio. 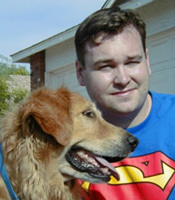 Stan appeared in several issues of Fantastic Four, including getting turned down for entry to the wedding of Reed and Sue Richards, and even Superman editor Julie Schwartz appeared for an entire issue on Superman during the end of his run on the title. Anyhow, a fascinating look into the outrageous adventures of 'ol Web-Head. How a 1970's-era SNL cast fits in with current continuity is a question of such epic proportion, the mind reels at the implications. Just as I wonder what Ronald Reagan must have thought when Rogue waved "hello" to him aboard Air Force One during the mid-80's. Surely, however, Mr. Storm should be served with the appropriate papers. Bannerizer made it easy for you to promote ClickBank products using banners, simply visit Bannerizer, and get the banner codes for your selected ClickBank products or use the Universal ClickBank Banner Rotator to promote all of the available ClickBank products.